I am constantly fine-tuning my beauty routine and products. Being a firm believer that your routine needs to evolve and change as your needs and seasons change, I'm always on the look out for different products that help me achieve what my current needs are. (Ok, I'm also kinda a beauty product junkie and I live at Sephora.) 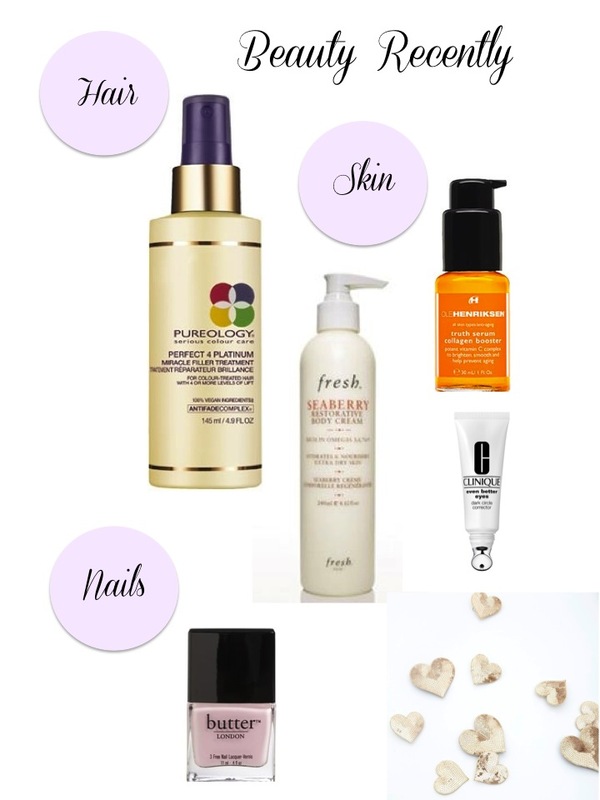 Recently I've found some great products that I'm currently loving and wanted to share. I process the bejesus out of my hair. Since it's naturally lighter, my stylist ends up having to use some harsher chemicals to get it the right color. I just started using this miracle hair filler and my hair is softer and more manageable. I alternate between this and Josie Mara's Argan Oil. I'm all about the serum right now and this serum I use in the mornings first thing. Not only is it bursting with vitamin C (and I'm hoping has transitive properties to help protect me against the plague that's been going around), but it has such a yummy citrus smell. I can't take credit for this find. Grace over at Stripes and Sequins turned me onto this one. It's light enough to not feel like I'm being weighed down, but heavy enough to pack a punch for the winter. I was already in love with their Sugar Lip Balms and now I'm loving their body line too! All of us are guilty of not getting enough sleep, myself included. I've come to realize that masking the problem with concealer might not be enough. So far, I'm loving this option from Clinique. I have a confession, as much as I love a good dark or bright nail color, I always gravitate back to the light pinks. Maybe it's the ballerina in me or maybe I'm just boring, but I adore the color and consistency of Butter London's Teddy Girl. Perfect for everything from the office to a night out on the town. What products are your go-tos and must-haves recently? Love this - and definitely need to try the serum as well as Butter (my sister loves that brand). Love the nail polish color! I've never tried Butter of London but I need to get this color. So pretty. I'm going to have to try something for the eyes. I look so tired all the time! Maybe it's the cold I have too :) Love the light pinks too - OPI's Kiss on the Chic is one of my favs. I totally swear by the Pureology Miracle filler and am a total Butter lover! !